The SV281 through SV287 Series valves are 2-way, pilot-operated, anti-waterhammer, and normally closed. These valves are designed to reduce or control waterhammer, which typically occurs with incompressible fluids when the closing of a valve creates a sudden change of the fluid velocity. Restriction of the pilot flow in these valves will prevent them from slamming closed. Valve and piping system life is enhanced since the noise, vibration, and shock of waterhammer are reduced. Where small flows (CV <3.0) at relatively low pressure differentials are present, the waterhammer is eliminated by the fixed restriction of the pilot flow. This is the standard design in the industry. 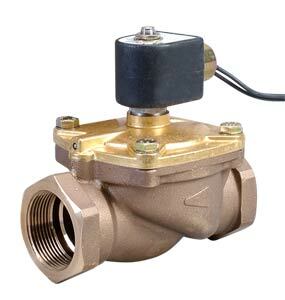 The SV283 through SV287 valves offer additional features. To reduce waterhammer in high-flow applications, a unique field adjustment device can effectively control the waterhammer in an application. The closing time on these valves can be adjusted by a 4-position selector. Position 1 allows the fastest closing, position 4 the slowest. There is also a manual override screw that is only used if the coil has failed. 注: *Response time is non-adjustable.